Antibiotics may be recommended to help control the growth of bacteria that create toxins and cause periodontitis. In some cases, Dr. Nicoara or the hygienist may place an antibiotic in the periodontal pockets after scaling and root planing. This may be done to help your body to control infection and to encourage normal healing, as well as attempt to avoid surgery. Scaling and root planning involves the use of a special ultrasonic device with water irrigation to cleanse the pockets of plaque and debris and remove hard calculus deposits. Local anesthetic is also used to numb the area to be treated in order to reach the base of the pocket without causing you discomfort during treatment. You can also bring along an iPod to help you relax. Usually the treatment of the entire mouth takes place in four appointments, each appointment is one hour long, so that one quadrant of the mouth is treated at a time. This should reduce inflammation and reduce pocket depths by allowing your gum tissue to re-attach to the tooth root surface. It is not unusual to experience some soreness in the treated area, and non-steroidal anti-inflammatory drugs, like Advil (Ibuprofen) are recommended to control this discomfort. Temperature sensitivity may also be a side-effect of the treatment, and should resolve in a few weeks. If it does not, other treatments are available to reduce this sensitivity. Finally, recession after treatment is normal since the swelling of the infected gum tissue is reduced after therapy. Click here to view the Post-Scaling Instructions. 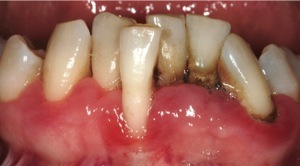 Sometimes teeth become loose for reasons other than periodontal infection. If the way your teeth come together when you bite down is unbalanced, then adjusting the biting surfaces of the teeth may help to alleviate excessive forces on a particular tooth or group of teeth which are loose. In other instances, the way the teeth fit whey you bite together is normal, but a grinding habit may be wearing down the surfaces of the teeth. Fabrication of a custom bite guard will help to control how pressure is distributed on the teeth and can protect your teeth and fillings or crowns from further wear and eventual replacement. Finally, if the alignment of the teeth is too complicated for the above treatments, a visit to the orthodontist may be necessary to re-align the teeth through the use of braces. Of vital importance in the treatment of periodontitis is the patient’s responsibility in maintaining proper oral hygiene in between dental visits. Oral hygiene instructions and directions in the use of various cleaning instruments are discussed in detail and individualized to your specific needs. 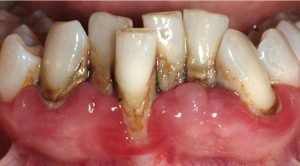 Without proper oral hygiene as performed by the patient, the success of therapy is greatly reduced. Sometimes, scaling and root planning is all that is needed to control the disease process, and a regular schedule of maintenance cleanings is necessary to monitor any change in disease activity through changes in pocket depth. If the pocket depths continue to progress or are not resolved with initial scaling and root planning, surgery may be necessary to correct the loss of bone and resultant pocketing. Surgical therapy is discussed in that section.